Pre-heat your oven to about 180c. Scatter the hazelnuts onto non-stick baking paper on a tray and bake in the oven until the hazelnuts start to brown slightly. This will take probably about 5-10 minutes so keep an eye on them. Shake the tray occasionally to turn the nuts so they don’t burn. When they are cooked, remove them from the oven and allow to cool. When adding them to the salad chop roughly into smaller pieces. It doesn’t matter if some nuts are still whole. Top and tail your beans. 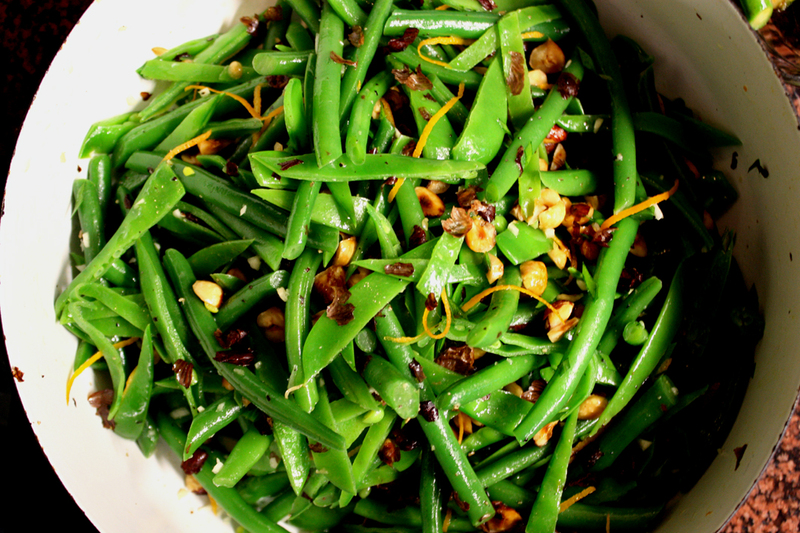 Remove the strings from the snow peas and slice finely lengthways to a similar width as the beans. Keep the beans and peas separate as when you cook them they will take a different amount of time. To prepare the greens, bring a large pot of water to the boil. Salt with approx 1 tsp of salt and add in the beans. Wait approx 1 minute and then add in your snowpeas. When the greens start to turn a bright green, remove from the heat and drain immediately. Refresh them by placing them in a bowl of cold water with ice to arrest the cooking process immediately. Once cold, drain again. To make the salad combine all the ingredients into a bowl. I would recommend zesting your orange over your salad to maximise the zesty taste.